Good morning sunshine and happy Monday!! So it’s an exciting day around here because I finally get to share the news about something super fun that I’ve been working on for the past couple of months. You guys, I’m launching a curated collection with Cloth +Cabin!! Eeek!! I can’t believe I just typed out those words, but it’s happening and I’m pretty much peeing my pants with excitement over the whole thing. I mean, is this even real life right now?! The Sarah Joy collection will launch this Wednesday, April 17th! What is Cloth + Cabin? 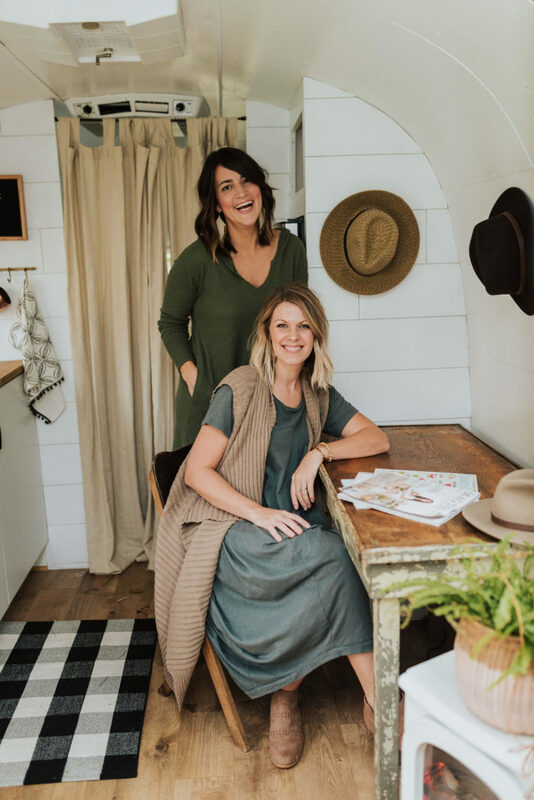 Cloth + Cabin is an online women’s clothing and home decor boutique with a killer farmhouse meets boho vibe. 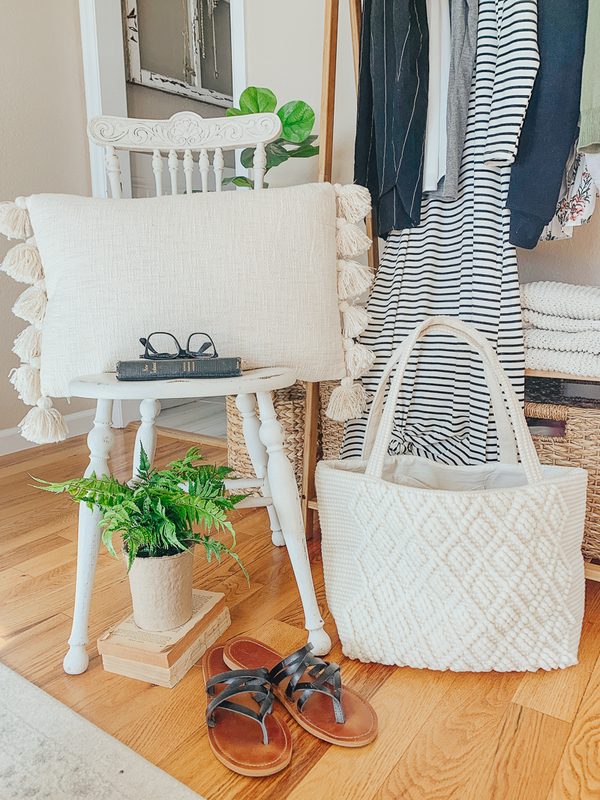 It’s pretty much the coolest shop full of all my favorites things–throw pillows, greenery, cozy sweatshirts, maxi dresses, and more. Everything is super high quality, but also really affordable at the same time. Plus it’s owned by two fabulous women, Amy and Meredith, who are basically the sweetest people ever. Check out their website here. What is a curated collection? A curated collection is basically a hand picked selection of items that all represent my style and design vibe. This all started when the sweet ladies at Cloth + Cabin reached out to me back in January and asked if I’d be interested in creating a collection with them. After the initial shock and surprise wore off I said “heck yes!” and we’ve been working on it since then. It’s been such a fun process and I’ve absolutely LOVED putting this all together. My ten piece collection will be a beautiful mix of home decor and clothing, all of which has a strong Sarah vibe. I can’t wait for you guys to see it! How can I shop the collection? The collection will launch this Wednesday, April 17th. I’ll be blogging about all the items in my collection that day and you can shop directly on the Cloth + Cabin website. I’ll also have a coupon for you guys, so definitely come back on Wednesday! The Sarah Joy collection will only be available until items sell out or about two weeks, whichever comes first. And it will not be restocked, so you’ll have to be a speedy shopper if you see anything you like! I’ve been so excited to share this news and I can’t wait to show you guys my full collection on Wednesday! I hope you love it as much as I do, and I just want to take a second to thank you all for the constant love and support. This blog is my happy place thanks to YOU and I’m so grateful I get to share these surreal, pinch me moments with my sweet blog family. See you back here Wednesday for the collection launch. Eeeek! This must be every bloggers dream. I recognize so many faces on their page. I am happy for you and wish you much success. Adore your blog. thank you so much Mona! Congratulations! Couldn’t happen to a sweeter person. I love that you say you are peeing your pants. Haha! That’s something I would say too! Congratulations! How exciting and you have great taste and style! Congratulations, Sarah!!! I love your style and can’t wait to see your collection! I CANNOT WAIT!!!!! Congratulations Sarah, this is aWeSoMe news!!!! I hope you have some plus girl sizes. We aren’t all tiny. Would love to buy some. I think they will Gail! CONGRATULATIONS on the big get!!! I know it will be a great success, and just the beginning of more exciting things for you! Congratulations Sarah! This is very exciting news! Can’t wait to see what you have created. Wishing you so much success. Can’t wait to see your collection! Thank you so much Jeannie!! 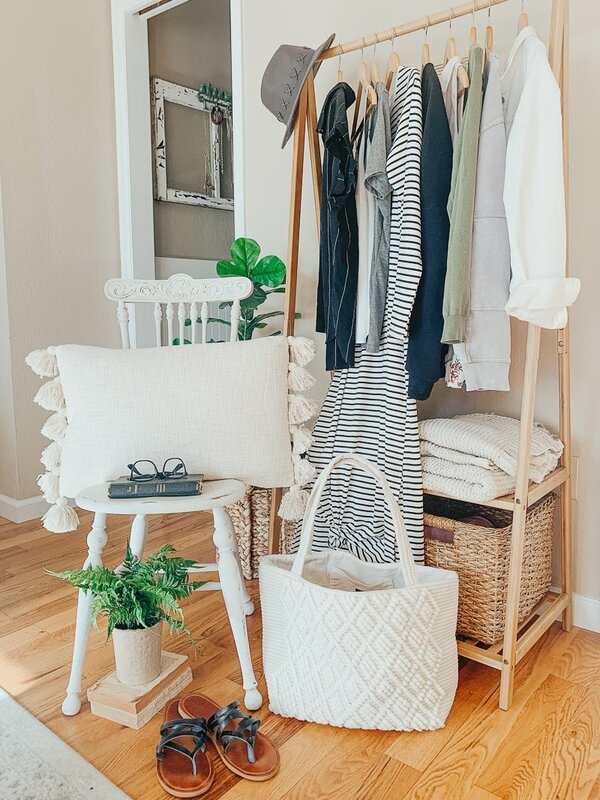 I love your style in your home and the clothes you wear! I only wish you would be able to have a permanent collection! Oh my goodness, wouldn’t that be fun?! Maybe one day Colleen, haha! haha thank you so much Jennifer!! So excited for you!! You work so hard everyday!! What an amazing and fun opportunity!! Enjoy!!!! How exciting!!! I can’t wait to see your collection! I absolutely love your style so I’m sure I will want one of everything! Congrats girl! How exciting for you. Can’t wait till Wednesday! Bravo Sarah, how exciting. Can’t wait to see what you have chosen for the collection. Wow Sarah! That is wonderful news! I’m so happy for you – it’s very well deserved. Can’t wait to see the collection! thank you Susan, I really appreciate that! How exciting! Can’t wait to see your collection! Sarah, congrats! You are going places lady! haha thank you so much Joanne! eeeek!! Thank you so much Lauren! Congratulations!! So excited for you! You’re such a sweet and encouring voice. Love that things like this are happening for you. Couldn’t happen to a nicer person! Congratulations! Congratulations Sarah! I’m so happy for you. Huge accomplishment! Congratulations for ongoing success in all your endeavors!!! Thank you Fran, I appreciate that!! Sarah! Yay! I cannot wait to shop your collection! Congratulations, my friend! What are the times on Wednesday? It should be up and live super early Wednesday morning! Oh wow such an exciting time in your life. This is VERY cool. Congrats!!! Yes Debbie, I’m so grateful. God is good!! So happy for you Sarah. Just a pity that your items won’t be available in the UK. I am such a big fan of your style and always look forward to receiving your emails. Hope your collection does really well. Regards Lindsay in the UK. I know Lindsay, that is a bummer! I’m sorry! But thank you so much for all your support–it truly means the world to me! Woohoo! Congratulations! Can’t wait to see it! I love everything about your blog,Congratulations! wow thank you so much Michelle!! Yay!! 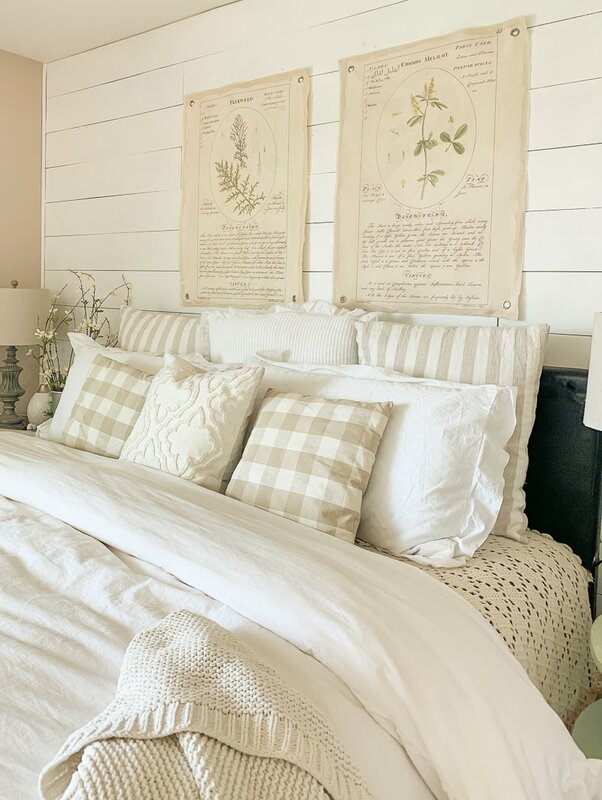 Are those botanical prints above your bed in the collection? I love them!! Yessssss Jenifer!! They’re in the collection! Wondering why your clothes only go to size large?????? The sizes are determined by Cloth + Cabin, so I don’t have any control over that. I’m sorry Sharon!